Handmade Detroit | Cool! We got named dropped in the new Naughty Secretary Club book! Cool! We got named dropped in the new Naughty Secretary Club book! 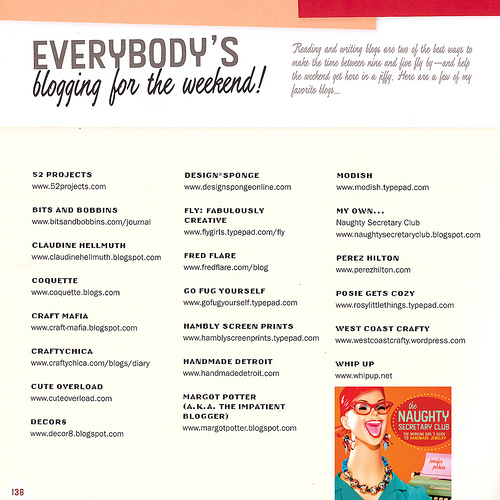 It’s true, Handmade Detroit is listed in the blogs Jennifer Perkins loves in her new book, The Naughty Secretary Club: The Working Girl’s Guide to Handmade Jewelry. We’ve never been named in a book before, so as you can imagine: Everyone around here is geeked! Thank you Jen! We’re going to have a review of the book as soon as we can get our mitts on a copy. Until then, you can check out the book’s sneak peek on Flickr and then grab your signed copy, too.